Belmont faculty members Drs. Sybril Brown (Media Studies), Marnie Vanden Noven (Sport Science), Mona Ivey-Soto (Education), Bill Hooper (Mathematics & Computer Science) and Cheryl Carr (Entertainment and Music Business) and Provost Dr. Thomas Burns recently attended the Southern Regional Education Board 2017 Institute for Teaching and Mentoring, as well as the Compact for Faculty Diversity in Atlanta, Georgia. 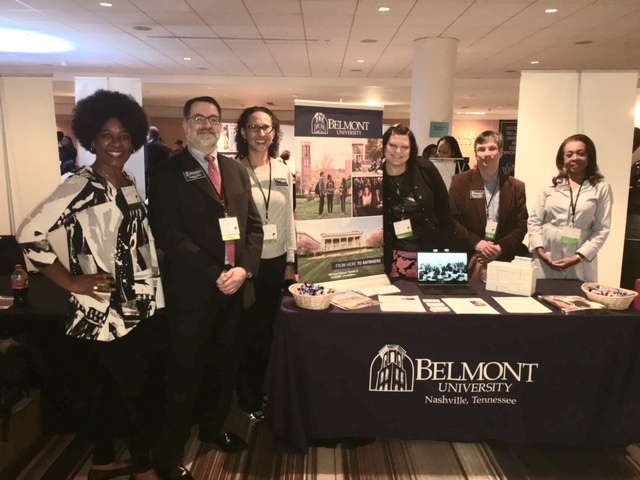 While there, the team met with potential faculty members and discussed opportunities currently available on Belmont’s campus. The largest conference for minority Ph.D.’s in the country, the Compact provides excellent opportunities for universities to connect with potential employees one-on-one, while allowing participants to become familiar with landscape of higher education. Representatives from Belmont, including Provost Burns, have attended the event for the past six years. For a video of the event, click here..